Reward The Trophy / Achievement "Manhunt"
A step closer to 100% game progress! In Grand Theft Auto IV, you have two sorts of police jobs: Vigilante and Most Wanted. 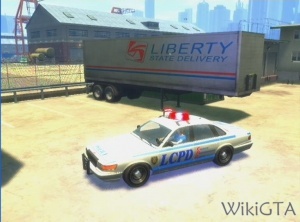 For the Most Wanted submission you have to kill 30 different people in Liberty City, ten on each island. To see the list you need to break in to the computer of a police car. You can break in to the computer by pressing [PS3] or the left shoulderbutton [X360] when your vehicle isn't moving. When inside the computer, you select View Most Wanted and then you can select ten different people. To see the people in Broker/Dukes/Bohan, you have to be in this city. To see the people of Algonquin, you need to be in Algonquin. And to see the criminals from Alderney, you need to be in Alderney. Each city has got ten Most Wanted criminals, and you have to kill all 30 to complete this submission. For killing a criminal, you won't get any money, but you can take the money and weapons the criminals drop. When you have killed the 30 criminals, your game progress will improve by 2% and you will unlock the Achievement / Trophy "Manhunt". The computer in the police vehicle can only be broken into when the vehicle doesn't move. In previous GTAs, you mustn't leave your vehicle, but in GTA IV you may leave your vehicle when you are at the criminal's location. When you can't kill the criminal and you fail the mission, you won't have the possibility to start the same criminal's mission right again, if you are in the neighbourhood of the criminal. Full health and armor are very handy when starting a Vigilante job. When your car doesn't start anymore because the engine broke down, you can simply call any number with your cellphone, and your car will start again. By selecting Call Police Backup in the police computer, you will get police support, and like this you can let the police do the job. When you become friends with Jacob, you can buy good weapons for a low price. This page was last modified on 28 June 2010, at 17:32.